Ok guys. I have a question I hope you can help me with. I will use the image below to illustrate what I want. I want to use Displacement on the man (I like the blobby effect it makes, and thats the one and only reason, so an alternative to displacement if it exists is also totally ok). 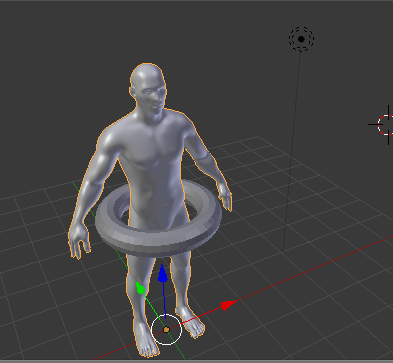 I want to drag the weight-slider to preferred size, but I want the blow-up-effect to be affected by the ring around his waist. In other words, I want to expand him around the ring. Kinda like having a rope around a balloon while you blow it up. I hope you guys can help and I hope I explained my problem in an understandable fashion(I'm Norwegian). Use 2 displacement modifiers with the same settings. 2nd will continue with displacing, but only around the object. To do that, paint and assign a vertex group to the modifier to influence only the right vertices. Simulating this inside Blender is not possible, because Blender does not simulate pressure inside volumes. With SoftBody sim there is a possibility to alter the edge springs to make the mesh sort of "blow up" (Length% under Soft Body Edges tab), but the result is not nice and does not look like inflating. Houdini can simulate pressure in volumes very nicely, the apprentice version is free and can import/export .obj(s) if you wanna try it. Following @Jaroslav's answer .. I guess you could play with the object painting its own vertex weights, using a Vertex Weight Proximity modifier..
Not the answer you're looking for? Browse other questions tagged displacement or ask your own question. 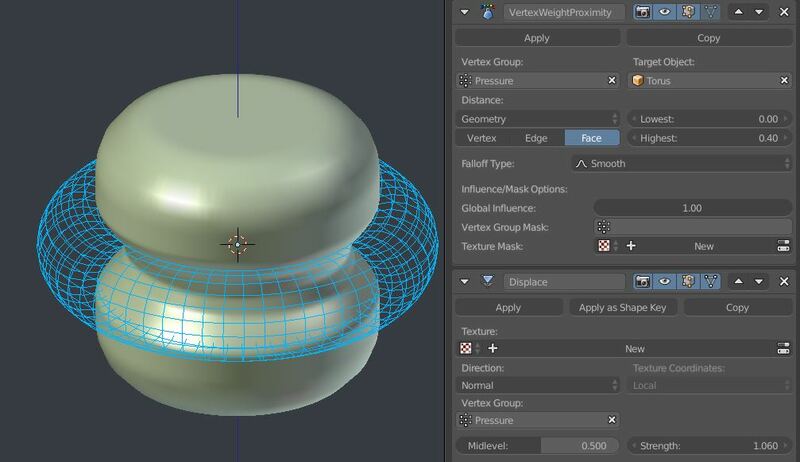 Displacement with nodes doesn't work, do I need a Displacement modifier?